Add ChIPmentation Kit for Histones to my shopping cart. Difficult and challenging histone ChIP-seq is now solved. 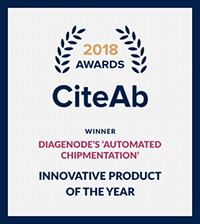 Diagenode’s latest technology for histone ChIP-seq, ChIPmentation is a ligation-free, tagmentation-based protocol that incorporates chromatin immunoprecipitation with NGS library preparation. Using histone ChIPmentation, you can avoid the multi-step ligation required for traditional histone ChIP-seq. 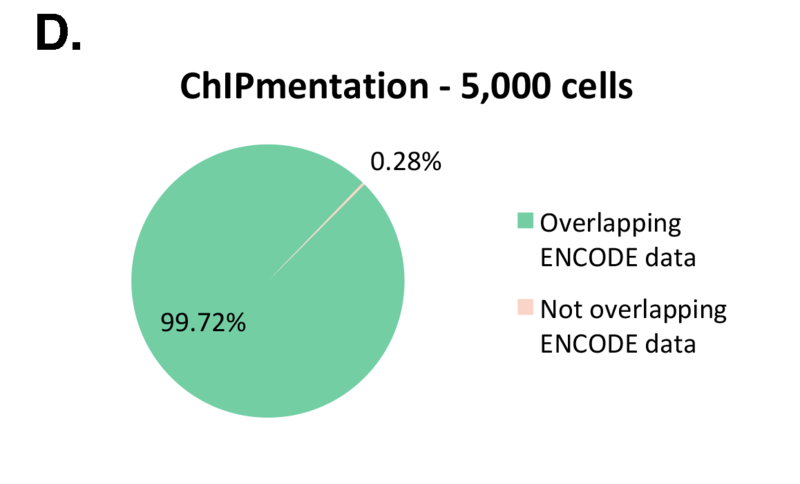 ChIPmentation enables an easier protocol, faster time to results, and excellent reproducibility for histone ChIP-seq from challenging and low input samples. ChIPmentation is based on tagmentation that allows library preparation to be integrated during the ChIP itself using transposase and sequencing-compatible adaptors. ChIPmentation involves much easier and shorter protocol with high efficiency for low input samples using optimized ChIP and NGS sample preparation. 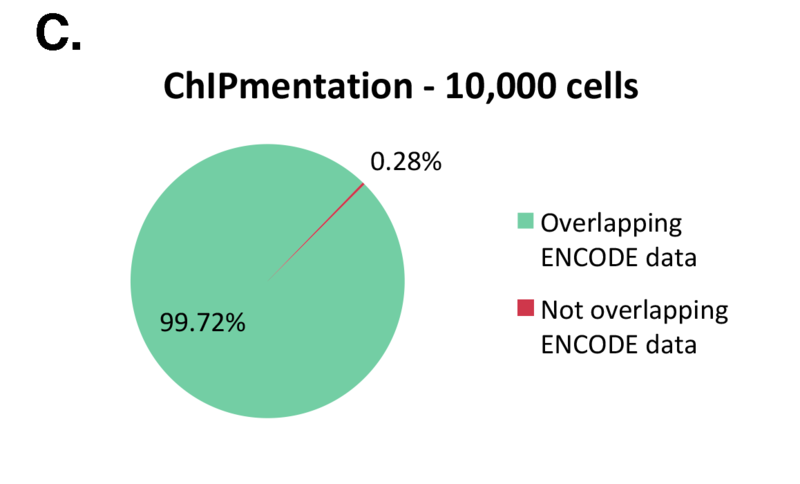 The new histone ChIPmentation technology has been tested on histone marks and compared to available datasets from the ENCODE project (Figure 1). ChIPmentation generated high quality data with low background. 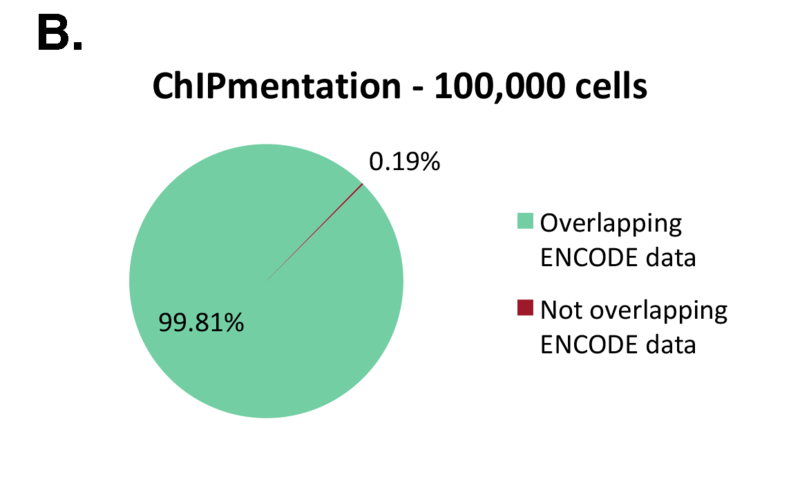 In addition, more than 99% of the top 40% peaks obtained with auto-ChIPmentation overlap with ENCODE datasets, which shows that ChIP-seq data obtained with ChIPmentation are highly reliable. Figure 1: ChIPmentation sequencing results obtained from decreasing starting amounts of cells. Chromatin preparation has been performed on 7 M K562 cells using the ChIPmentation Kit for Histones (Cat. no. C01011010). Diluted chromatin from 100.000, 10.000 and 5.000 cells was used for the immunoprecipitation with the Diagenode antibody targeting H3K4me3 (Cat. no. C15410003). A. Distribution of the ChIPmentation readsets in a representative region of the genome. B., C. and D. Comparison of the top 40% peaks from 100.000 (B. ), 10,000 (C.) and 5.000 (D.) cells with ENCODE dataset. Figure 2: ChIPmentation sequencing results. Chromatin preparation has been performed on 7 M HeLa cells using the ChIPmentation Kit fro Histones. Diluted chromatin from 100.000 cells was used for the immunoprecipitation with the Diagenode antibody targeting H3K4me3 (Cat. no. C15410003) and H3K27me3 (Cat. no. C15410195) and IgG (Cat. no. C15410206). Diagenode strongly recommends using this:	ChIPmentation Kit for Histones (Diagenode Cat# C01011010). Click here to copy to clipboard. Thank you for your interest in our ChIPmentation Kit for Histones.